From left, Dr. Edward F. Rossomando, CRET founding director, and director of the Biodontics Program, University of Connecticut School of Dental Medicine; Loma Linda University School of Dentistry Dean Charles J. Goodacre; Loma Linda University President Richard Hart, and Charles F. Cohen, chair, Industry Advisory Council for CRET, cut the ribbon opening the Hugh Love Center for Research & Education in Technology. 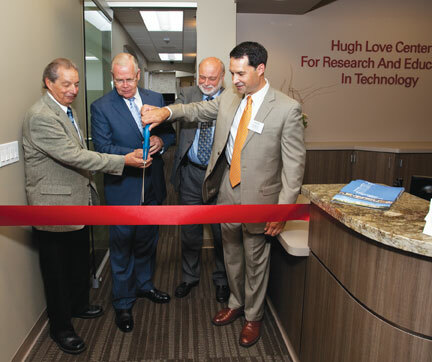 The Loma Linda University School of Dentistry hosted a ribbon cutting and open house for its groundbreaking Hugh Love Center for Research and Education in Technology on Wednesday, August 22, in Prince Hall room 2270. Consistent with the school's tradition of innovation, School of Dentistry Dean Charles Goodacre responded in late 2009 to a request for proposals from the Center for Research & Education in Technology, Inc. (CRET), a forward-looking nonprofit association of dental manufacturers, suppliers, and an insurance company. Dr. Edward Rossomando, professor at the University of Connecticut and CRET president and visionary who established the association in 2004 to arrange access for dental students and faculty to the most technologically advanced tools for dental care delivery, was present--along with Charles Cohen, CRET CEO, and representatives from most of the 22 dental technology companies that contributed equipment--to celebrate the first embodiment of his vision. The Hugh Love Center is comprised of six operatories and a three-chair open clinic. Under the direction of Dr. Nadim Baba, professor of restorative dentistry, the 3,000-square-foot center, with equipment provided by six different manufacturers, will enable qualified students, under faculty supervision, the opportunity to treat patients using the latest in dental technology. The center's name honors alumnus Hugh C. Love, D.D.S. (class of 1961), whose unrestricted trust to the School of Dentistry made possible the renovation of the former orthodontic clinic on the second floor of Prince Hall immediately adjacent to the school's group pre-doctoral clinic. CRET conceived the plan whereby the School of Dentistry would supply space, support staff, and integration of technology into the curriculum, while CRET would design the space and its consortium of dental equipment manufacturers would provide the technologically advanced equipment to make the center possible. "It is not only students and faculty, but patients, that will derive many benefits from the Center," said Dean Goodacre, "especially the ability to meld the key foundational technical skills required of exceptional practitioners with innovative technologies that can optimize patient care in an increasingly technology-driven world. Additionally, students will learn to integrate their advanced preclinical instruction with a technologically advanced clinical experience that will prepare them to make effective decisions regarding the incorporation of technology into their practices." Starting in the fall quarter of 2012, fourth-year dental students will treat patients at the Hugh Love Center for at least two weeks per student. The optimal environment, most recent model operatories, and technologically advanced equipment will give Loma Linda University students a unique opportunity to determine their personal preferences as well as assess the advantages provided by different types and styles of delivery systems. Mark Supanchick, design specialist, developed plans for the center. Construction was implemented by Dr. Bryan Marshall, owner of Alliance Healthcare Development and Construction; with oversight by Dr. Joseph Caruso, associate dean for strategic initiatives and faculty practices. This story was originally published on the Loma Linda University School of Dentistry Web site, dentistry.llu.edu.